Dome Data Protection is a powerful solution that lets you monitor and control the movement of confidential information in your network. 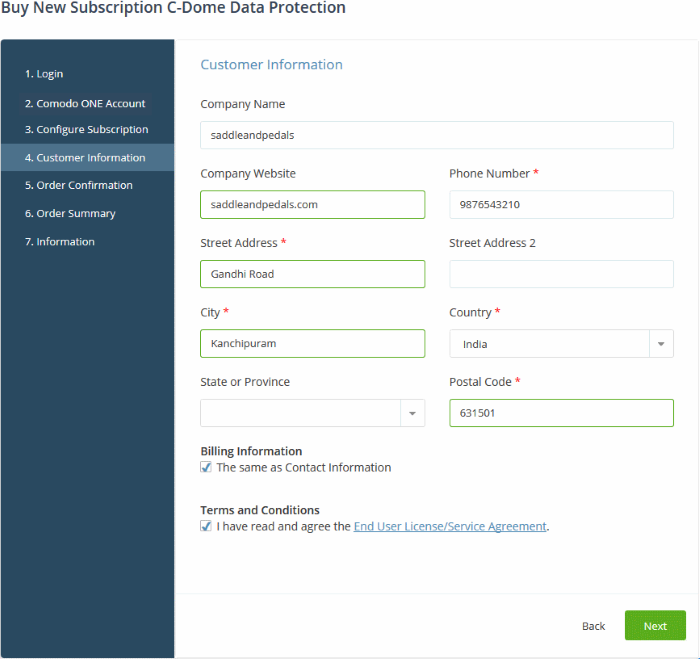 Dome Data Protection is available only for C1 Enterprise customers. 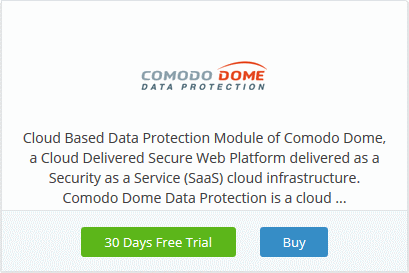 Dome Data Protection and Dome Antispam are premium add-ons for 'Comodo Dome Secure Web Gateway'. These add-ons can only be added to your account if you have Secure Web Gateway. 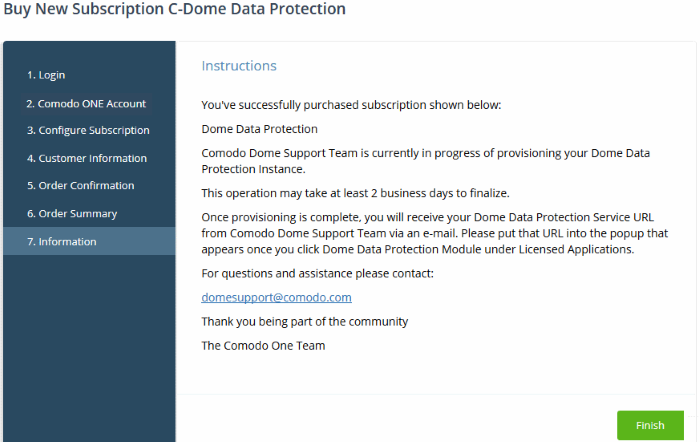 The basic version of Comodo Dome Data Protection is free for thirty days and can be added to your account at any time. 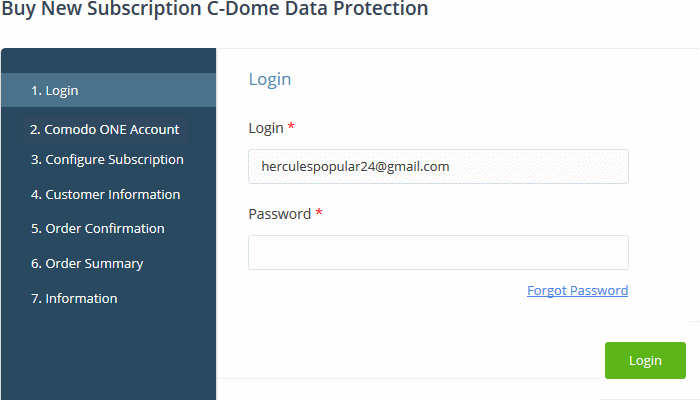 Alternatively, you can add Dome Data Protection by linking another Comodo Accounts Manager (CAM) or Comodo One account that already has a Dome Data Protection license. The service can then be used by both accounts. Cumulative usage and validity are bound to the original license limitations. You will be taken to the respective subscription page. The example shown below is for the trial version. If you choose the paid version, click the 'Buy New' button in the 'Comodo One Account' page then select a subscription package. Click 'Next' to provide your customer information. If you chose the trial version then you'll go straight to the customer information screen after login. Paid version - you will be taken to the 'Order Confirmation and Payment' page. Review your order, enter your card details then click 'Next' to proceed. Review your order. Click 'Back' if you want to make changes. Click 'Next' to submit your order. You will also receive an email confirmation which contains your license key. Click 'Next' on the order confirmation screen. We will send you an email with the URL of your instance after our support team has finished setting it up. You need to enter this URL when you first login to the application. The license will be activated and Comodo Dome Data Protection will be added to your list of applications. 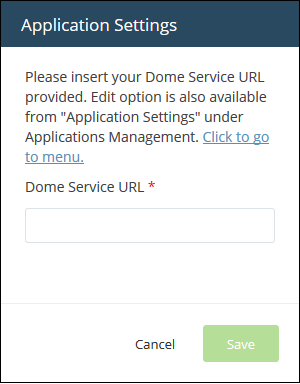 Click 'Instructions' to view information about the Dome Data Protection service URL configuration by Comodo. The URL information will be sent to your email within two business working days. Note: You should have configured the Dome Data Protection URL details during your first login or through the Settings tab under 'Management' > 'Applications'. The details will be available in the 'Information' section at the end of the sign up process. The service URL will also be emailed to you when ready. Also you need to contact domesupport@comodo.com with the public IP address of your location to enable user interface access and to configure web and endpoint policy settings. Click 'Applications' on the menu bar then choose 'Dome Data Protection' from the list. Click 'Applications' on the menu bar then click 'All Applications' from the list. All licensed modules for your account will be displayed. 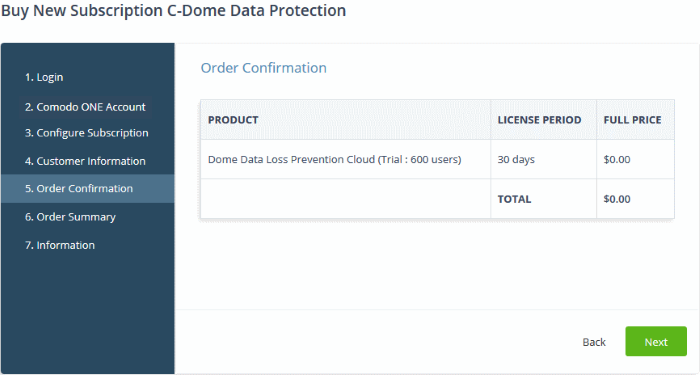 The Dome Data Protection interface will open. If you have not configured the URL in the Settings tab under 'Management' > 'Applications' then the 'Application Settings' dialog will be displayed. Enter the service URL that was sent to your email and click 'Save'.